Mandy Ramdsen at the top of the world. 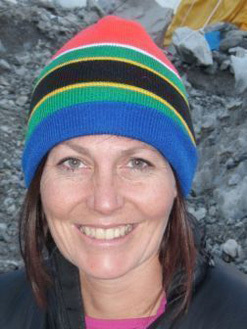 At 07h45 on 22 May 2010, Mandy Ramsden was on top of the world. Literally. The South African mountaineer had just reached the 8 848-metre summit of Mount Everest. And she had plenty to be excited about. Not only is she now the second South African woman to climb Everest, she is also the first South African – indeed, African – woman to have climbed the Seven Summits, the highest peaks on each of the world’s seven continents. The first South African woman to climb Everest was Cathy O’Dowd, who reached the top on Ian Woodall’s controversial first South African Everest expedition in 1996, during which cameraman Bruce Herrod died. O’Dowd went on to climb Everest from the north side in 1999, becoming the first woman in the world to summit from both sides. 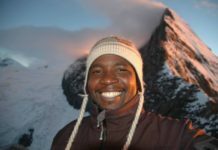 Ramsden, a Zimbabwe-born single mother of four, has been working to claim the Seven Summits for five years. Since conquering Africa’s Mount Kilimanjaro in 2006, she has ticked off Mount Elbrus in Europe (2006), Aconcagua in South America (2006), Carstenz Pyramid (Puncak Jaya) in Australasia/Oceania 2007, Denali (Mount McKinley) in North America (2008), Vinson Massif in Antarctica (2009) and now the Big E.
Everything went perfectly for the Adventure Consultants team, led by veteran New Zealand guide Mike Roberts and made up of Ramsden, fellow South African Tony Hampson-Tindale and Irishman James Haydock. After a stay down the valley in the village of Periche, enjoying the oxygen-rich air of the lower altitude and recovering from their acclimatisation programme, the team moved back to base camp on 11 May. Waiting for the weather window that would allow them to start the climb, the team focused on their preparation, visualising the climb ahead, fitting and testing their oxygen masks and regulators, familiarising themselves with the process of changing oxygen bottles, and experimenting with various combinations of headgear and warm clothing. Finally, on 19 May, they got the green light and made their way up through the Khumbu Icefall for the last time. On 21 May the team arrived at their final camp on the South Col, at 7 935 metres less than a thousand metres short of the summit. After a few hours rest and rehydration Ramsden and team leader Roberts left the South Col at 22h00. Although it was snowing lightly they could see the stars above – conditions looked good. They radioed in at the Balcony, roughly the half-way point in terms of height gain, and then made their way along the snowy southeast ridge to the South Summit Rocks, reaching the South Summit as dawn was breaking. After changing their oxygen bottles they were ready for the final push. At 06h00 the first team member, James Haydock, stood on the summit. 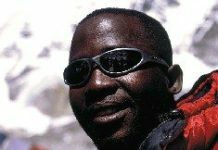 Roberts and Ramsden, accompanied by Pemba Choti, on his sixth summit and Passang Bhote, on his third, topped out just under two hours later. On the summit with them was another new record holder: Jordan Romero, a 13-year-old American from Big Bear, California, and the youngest to ever climb Everest. Romera, climbing with his father and three sherpa guides, climbed the mountain’s northeast ridge from Tibet because China has no age restrictions for Everest climbers. Those attempting to climb the south side from Nepal must be a minimum of 16 years old. The previous record for the youngest summiteer was held by Temba Tshering of Nepal, who summited at the age of 16 in 2001. After the obligatory photo shots in her South African-made Cape Storm ASR high altitude down suit, Ramsden and the rest of the Adventure Consultants team returned to the South Col for the night, before descending to Camp 2 the next day. They awoke to falling snow the next morning but, undeterred, were the first team to leave camp and begin the strenuous task of trail-breaking down to base camp. They are all now safely back at the camp, refreshed, clean, well fed – and celebrating. It was a good climbing season for South African mountaineers on Everest. A day after Ramsden stood on the world’s highest peak, five members of the South African Adventure Dynamics team, and team leader Sean Disney, summited from Everest’s north side. It was a particularly poignant occasion for Disney and team member Vaughan de la Harpe, both also Seven Summiteers – exactly four years ago they summited Everest from the south side. Three climbers from the Adventures Global team, led by South African Ronnie Muhl and comprising both South Africans and Australians, summited on 23 May with two more reaching the top on the 24th. 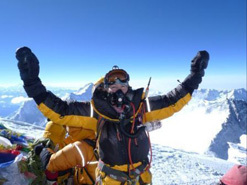 Muhl himself, who had climbed Everest from the north side in 2007, decided to turn back before the summit. To date 424 climbers have summited Everest in 2010, with two fatalities. A new record for the number of ascents was set by the 50-year-old Apa Sherpa, leader of Eco Everest Expedition 2010, who now has 20 summits under his belt. China and Nepal have finally agreed that the height of world’s highest mountain is 8 848 metres – the height of its summit snows. The Chinese previously argued that it should be measured by its rock height, 8 844 metres. That said, the mountain is growing taller all the time, thanks to the collision of tectonic plates, so they might both be wrong. In May 1999 an American team used GPS technology to record a height of 8 850 metres. This figure is now used by the US National Geographic Society, although it has not been officially accepted by Nepal.